£2.99 for Hive Live Membership at Hive Home - Sign Up for Special Discounts! Hive has been running since September 2013, when it was formed by a team from British Gas, with a mission to create fully connected homes and smart home security solutions which incorporate the latest in design principles to make them simple and beautiful. Passionate about open source technology, design and problem solving, the Hive team have become market leaders in their field. Their connected thermostat is now the most popular in the UK. Their products are designed to be simple and easy to use so that everyone from the kids to the grandparents can use them! Hive products will also be easy on your pocket. Hive Active Heating is designed to help you cut your fuel bills by lowering the amount of energy that you use. Set your heating schedule with the easy-to-use Hive home app and you could be saving hundreds of pounds every year as well as being kinder to the planet. Sign up to Hive Live and you’ll get 12-month warranty of your Hive heating system, discounts on additional products as well as extra peace of mind. How do I use my Hive Home promotional code? Click on the offer of your choice at vouchercloud and copy the promotional code if provided. Follow our link to the Hive website, select the product you want, choose your delivery options and click ‘add to basket’. At the checkout, under the ‘add a promotional code’ tab, enter your vouchercloud code, click ‘Apply’ and continue to the secure checkout. Carry on to the secure checkout, enter your contact and payment details and complete your payment. Any offers which don’t require a discount code will be applied automatically. Is there a Hive Home outlet near me? You can buy Hive products online through their website, as well as from this list of stockists. How do I install my Hive Active Heating system? You can get your Hive Hub safely installed by a qualified British Gas engineer in less than an hour. Or, if you want to do it yourself, it should take around 90 minutes. You can find further information about installing Hive here. Is Hive Active Heating compatible with different boiler types? Hive works with all gas and LPG central heating systems. For full details, have a look at this. Hive inquiries line: 0800 980 0649. Lines are open 8 am - 9 pm Mon to Sun. Products & technical support: 0800 980 8614. Or email help@hivehome.com. Contact address: 19-22 Rathbone Place, London, W1T, 1HY. Standard (3-5 working days) - Free. Next working day (order by midday) - £5. If you have bought a product directly through Hive Home which turns out to be faulty, please contact help@hivehome.com. Terms & Conditions apply. Creators of one of the most innovative home heating systems currently on the market, Hive can make your home smarter, simpler and more efficient. 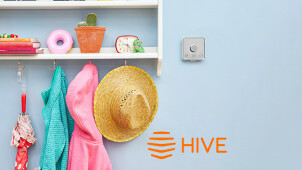 Founded by British Gas, Hive now offers the UK’s number one connected thermostat. With a Hive home discount code, you can access the latest design and technology for less. Plus, you can control your heating from anywhere in the home with ease - Hive Home always has your comfort in mind. Getting a new Hive home heating system installed in your home is easy as one, two, three! You can get the whole system set up in under an hour by a fully qualified British Gas engineer. At the checkout select your preferred installation date and you’ll be emailed within three days with your account details. Hive also provide elegant and efficient LED smart bulbs and a range of wireless sensors to create a fully connected home. Check out their website for their full range of products. Hive’s fantastic range of products are designed to help you transform your house or flat into the smart, modern, efficient home you’ve always wanted. Hive Active Heating is Hive’s wireless thermostat system, a smarter way to control your house’s temperature. With a Hive home promo code, you could soon be using your phone to control your house’s heating and hot water, as well as making big savings on your fuel bills.